During a tour of the Cockayne Farmstead, we get asked a lot of questions about the Cockayne family, the farm, and the preservation project. Here are a few of the most frequently asked questions and their answers. Was the Cockayne Farmstead involved in the Underground Railroad? 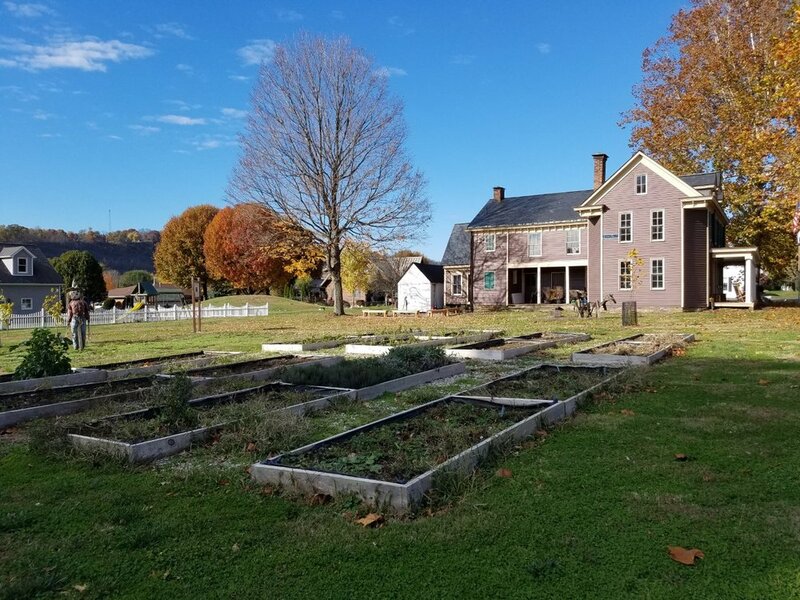 The story of escaped slaves crossing the Ohio River, entering a hidden tunnel cut into the bank of the river, following it into the basement of the Cockayne Farmstead, and sheltering in a small "hidden" upstairs room has long been a local legend. As wonderful as it would be to have a connection to the famed Underground Railroad, there is no evidence that the Cockayne family was sheltering runaway slaves. A professional archaeologist has searched the small basement of the house for any sign of a hidden tunnel, but he was unable to find any opening. Many homes have also been built between the farmhouse and the river without excavating any tunnel. The "hidden" room, which does exist in upper floor of the home, consists of a small room accessed by what seems to be a closet door. The room has small closet doors that access the eaves on either side walls and a large window in the wall across from the doorway that looks towards the river. Although the room is certainly interesting and even mysterious, it is almost certainly not a shelter for runaway slaves. Firstly, the entrance to the room, while confusing, is not hidden. The door is clearly visible and if opened leads directly into the small room without any false wall. Secondly, the room does not blend into the structure of the house. It actually sticks off the back of the house and is extremely visible, especially with the window. Slave catchers were trained to look for hidden rooms in the homes that they searched and this room would have offered a very poor hiding place. It is much more likely that this room was used as a maid's bedroom, especially since a small twin bed, dresser, and potbelly stove were discovered in the room. How rich were the Cockaynes? This is a very interested question and cannot be answered with a simple number. We have to place the family into their appropriate context as a 19th century family who were farmers and residents of the brand new state of West Virginia. We also must compare the family to others living and working in this area of the country. The Cockayne's were a landowning family with 539 acres in the fertile Ohio River Valley. Owning a home or land was simply unattainable for many Americans in the 19th century. However, unlike the very rich, the Cockayne's needed the land that they owned as their source of income. They owned a working farm that was successful enough to allow a comfortable lifestyle, but the family still relied on the success of the farm business. The family did own one servant, a maid, during the time that Samuel A.J. owned the farm. This would have entered them into the "servant-keeping class" which was a coveted status symbol. This meant that the family no longer had to the less than pleasant chores of carrying water, emptying chamber pots, dusting, and washing the floors. But it is important to remember that the Cockayne's had only one servant while members of the upper crust had dozens including cooks, butlers, footmen, grooms, chauffeurs, maids, and nannies. The Cockayne's were able to afford good educations for their children. Bennett's son, Alexander, graduated from the University of Virginia with a law degree and went on to teach the first school in Glen Dale which was located in the Cockayne farmhouse. Samuel A.J. was able to make sure that his six children were all very well educated as well. For his five daughters, this meant that they not only had book learning, but they were also taught music and art which they all excelled at. Finally, we can look at the farmhouse itself. While the house is certainly spacious and contains most of necessary rooms of a well to do family, including two parlors, an entrance hall, and a dining room, it is lacking other rooms that the upper crust had to have. These would include a library, ballroom, music room, and other single purpose rooms. Also, the Cockayne house is rather plain. The woodwork, while beautiful, is not ornate, the light fixtures are simple, and the furniture is oilcloth (a material used by the less well off). Now that we have compared how the Cockayne's lived to how those around them existed we can firmly place the Cockayne's into the middle class. Although they were one of the wealthiest families in Marshall County, their wealth was eclipsed by industrial leaders living in Wheeling and Pittsburgh such as the Stifels, the Oglebays, the Carnegies, and the Fricks. It is, however, important to realise that there were different levels to the middle class then the same way there are today. The Cockaynes were higher than the lower middle class because they owned property, could afford good education and a servant, and had a large house. They were also lower than the upper middle class because they only had one home and one servant and needed to actively work in order to sustain their life style. These traits mark them out as middle middle class. Other professions that would have fit into this category would have been lawyers, bankers, and doctors which happen to be the professions of some of the gentlemen who married into the Cockayne family.